This article is about the 1813 battles. For the 1814 battle, see History of Toronto. The Battle of York was fought on April 27, 1813, in York (present-day Toronto), the capital of the colonial province of Upper Canada (present-day Ontario), during the Anglo-American War of 1812. An American force supported by a naval flotilla landed on the lake shore to the west and advanced against the town, which was defended by an outnumbered force of regulars, militia and Ojibway natives under the overall command of Major General Roger Hale Sheaffe, the Lieutenant Governor of Upper Canada. Battle of York by Owen Staples, 1914. The American fleet before the capture of York. Sheaffe's forces were defeated and Sheaffe retreated with his surviving regulars to Kingston, abandoning the militia and civilians. The Americans captured the fort, town and the dockyard. They themselves suffered heavy casualties, including force leader Brigadier General Zebulon Pike and others killed when the retreating British blew up the fort's magazine. The American forces subsequently carried out several acts of arson and looting in the town before withdrawing. Though the Americans won a clear victory, it did not have decisive strategic results as York was a less important objective in military terms than Kingston, where the British armed vessels on Lake Ontario were based. York, the provincial capital of Upper Canada, stood on the north shore of Lake Ontario. During the War of 1812, the lake was both the front line between Upper Canada and the United States, and also part of the principal British supply line from Quebec to the various armies and outposts to the west. At the start of the war, the British had a small naval force, the Provincial Marine, with which they seized control of the lake, and also of Lake Erie. This made it possible for Major General Isaac Brock, leading the British forces in Upper Canada, to gain several important victories during 1812 by shifting his small force rapidly between threatened points to defeat disjointed American attacks individually. HMS Sir Issac Brock was a sloop-of-war being built in York. Both sides engaged in building freshwater fleets in an effort to gain naval supremacy in Lake Ontario. The United States Navy appointed Commodore Isaac Chauncey to regain control of the lakes. He created a squadron of fighting ships at Sackett's Harbor, New York by purchasing and arming several lake schooners and laying down new purpose-built fighting vessels. However, no decisive action was possible before the onset of winter, during which the ships of both sides were confined to harbour by ice. To match Chauncey's ships, the British laid down a sloop of war at Kingston, and another in the York Naval Shipyards. This vessel was named Sir Isaac Brock after the general, who had been killed at the Battle of Queenston Heights the previous October. On January 13, 1813, John Armstrong, Jr. was appointed United States Secretary of War. Having been a serving soldier, he quickly appreciated the situation on Lake Ontario, and devised a plan by which a force of 7,000 regular soldiers would be concentrated at Sackett's Harbor on April 1. Working together with Chauncey's squadron, this force would capture Kingston before the Saint Lawrence River thawed and substantial British reinforcements could arrive in Upper Canada. The capture of Kingston and the destruction of the Kingston Royal Naval Dockyard together with most of the vessels of the Provincial Marine, would make almost every British post west of Kingston vulnerable if not untenable. After Kingston was captured, the Americans would then capture the British positions at York and Fort George, at the mouth of the Niagara River. 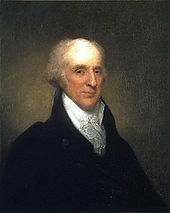 Appointed as the United States Secretary of War in January 1813, John Armstrong, Jr. originally planned for an attack on Kingston, but later acquiesced to changes that made York the attack's target. Armstrong conferred with Major General Henry Dearborn, commander of the American Army of the North, at Albany, New York during February. Both Dearborn and Chauncey agreed with Armstrong's plan at this point, but they subsequently had second thoughts. That month, Lieutenant General Sir George Prevost, the British Governor General of Canada, travelled up the frozen Saint Lawrence to visit Upper Canada. This visit was made necessary because Major General Roger Hale Sheaffe, who had succeeded Brock as Lieutenant Governor of Upper Canada, was ill and unable to perform his various duties. Prevost was accompanied only by a few small detachments of reinforcements, which participated in the Battle of Ogdensburg en route. Nevertheless, both Chauncey and Dearborn believed that Prevost's arrival indicated an imminent attack on Sackett's Harbor, and reported that Kingston now had a garrison of 6,000 or more British regulars. Even though Prevost soon returned to Lower Canada, and deserters and pro-American Canadian civilians reported that the true size of Kingston's garrison was 600 regulars and 1,400 militia, Chauncey and Dearborn chose to accept the earlier inflated figure. Furthermore, even after two brigades of troops under Brigadier General Zebulon Pike reinforced the troops at Sackett's Harbor after a gruelling winter march from Plattsburgh, the number of effective troops available to Dearborn fell far short of the 7,000 planned, mainly as a result of sickness and exposure. During March, Chauncey and Dearborn recommended to Armstrong that when the ice on the lake thawed, they should attack the less well-defended town of York instead of Kingston. After capturing York, they would then attack Fort George. Although York was the Provincial capital of Upper Canada, it was far less important than Kingston as a military objective. Armstrong, by now back in Washington, nevertheless acquiesced in this change of plan as Dearborn might well have better local information. Historians such as John R. Elting have pointed out that this effectively reversed Armstrong's original strategy. Also, by committing the bulk of the American forces at the western end of Lake Ontario, it would leave Sackett's Harbor vulnerable to an attack by British reinforcements arriving from Lower Canada. The Americans appeared off York late on April 26, 1813. Chauncey's squadron consisted of a ship-rigged corvette, a brig and twelve schooners. The embarked force commanded by Brigadier General Zebulon Pike numbered between 1,600 and 1,800, mainly from the 6th, 15th, 16th and 21st U.S. Infantry, and the 3rd U.S. Artillery fighting as infantry. Dearborn, the overall army commander, remained aboard the corvette Madison during the action. Position of the American and British forces at York prior to battle. The town's defences included Fort York, a short distance west of the settlement, with the nearby "Government House Battery" mounting two 12-pounder guns. A mile west was the crude "Western Battery", with two obsolete 18-pounder guns. (These weapons were veterans of earlier wars and had been disabled by having their trunnions removed, but they were fixed to crude log carriages and could still be fired.) Further west were the ruins of Fort Rouillé and another disused fortification, the "Half Moon Battery", neither of which was in use. Major General Sheaffe, the Lieutenant Governor of Upper Canada, was present at York to transact public business. He had under his command only four companies of regulars. The Militia was ordered to assemble, but only 300 of the 1st and 3rd Regiments of the York Militia could be mustered at short notice. There were also about 40 to 50 natives (Mississaugas and Ojibwa) in the area. Early on April 27, the first American wave of boats, carrying Major Benjamin Forsyth's company of the U.S. 1st Rifle Regiment, landed about 4 miles (6.4 km) west of the town, supported by some of Chauncey's schooners firing grapeshot. Because Sheaffe could not know where the Americans would land, Forsyth's riflemen were opposed only by some of the Natives led by Indian Agent James Givins, who were outflanked and retreated into the woods after a stiff resistance. Sheaffe had ordered a company of the Glengarry Light Infantry to support the Natives, but they became lost in the outskirts of the town, having been misdirected by Major-General Æneas Shaw, the Adjutant General of the Canadian Militia, who took some of the militia north onto Dundas Street to prevent any wide American outflanking move. As three more companies of American infantry landed accompanied by General Pike, the grenadier company of the 8th (The King's) Regiment of Foot charged them with the bayonet. The grenadiers were already outnumbered and were repulsed with heavy loss. Pike ordered an advance by platoons, supported by two 6-pounder field guns, which steadily drove back the other two companies of Sheaffe's redcoats (another company of the 8th regiment, and one from the Royal Newfoundland Fencibles). Brig. Gen. Zebulon Pike was mortally wounded near the end of the battle, struck by debris from an explosion set off at the fort's magazine. The British tried to rally around the Western battery, but the battery's travelling magazine (a portable chest containing cartridges) exploded, apparently as the result of an accident. This caused further loss (including 20 killed) and confusion among the British regulars, and they fell back to a ravine north of the fort, where the militia were forming up. Meanwhile, Chauncey's schooners, most of which carried a long 24-pounder or 32-pounder cannon, were bombarding the fort and Government House battery. (Chauncey himself was directing them from a small boat). British return fire was ineffective. Sheaffe decided that the battle was lost and ordered the regulars to retreat, setting fire to the wooden bridge over the River Don east of the town to thwart pursuit. The militia and several prominent citizens were left "standing in the street like a parcel of sheep". Sheaffe instructed the militia to make the best terms they could with the Americans, but without informing the senior militia officers or any official of the legislature, he also dispatched Captain Tito LeLièvre of the Royal Newfoundland to set fire to the sloop of war HMS Sir Isaac Brock under construction at York's Naval Shipyard, and to blow up the fort's magazine. When the fort's magazine exploded, Pike and the leading American troops were only 200 yards (180 m) away, or even closer. The flag had been left flying over the fort as a ruse, and Pike was questioning a prisoner as to how many troops were defending it. Pike was mortally injured by flying stones and debris. The explosion killed 38 American soldiers and wounded 222. Captain John Robinson of the York Militia. Robinson assisted two other officers from the militia during their negotiations for surrender. Colonel William Chewett and Major William Allen of the 3rd York Regiment of militia tried to arrange a capitulation, assisted by Captain John Beverley Robinson, the acting Attorney General of Upper Canada. The process took time. The Americans were angry over their losses, particularly because they believed that the ship and fort had been destroyed after negotiations for surrender had already begun. Nevertheless, Colonel Mitchell of the 3rd U.S. Artillery agreed to terms. While they waited for Dearborn and Chauncey to ratify the terms, the surrendered militia were held prisoner in a blockhouse without food or medical attention for the few wounded. Forsyth's company of the 1st U.S. Rifle Regiment was left as guard in the town. At this stage, few Americans had entered the town. The next morning, the terms had still not been ratified, since Dearborn had refused to leave the corvette Madison. When he eventually did, Reverend John Strachan (who held no official position other than Rector of York at the time) first brusquely tried to force him to sign the articles for capitulation on the spot, then accused Chauncey to his face of delaying the capitulation to allow the American troops licence to commit outrages. Eventually, Dearborn formally agreed to the articles for surrender. The Americans took over the dockyard, where they captured a brig (Duke of Gloucester) in poor state of repair, and twenty 24-pounder carronades and other stores intended for the British squadron on Lake Erie. Sir Isaac Brock was beyond salvage. The Americans had missed another ship-rigged vessel, Prince Regent, which carried 16 guns, as she sailed for Kingston to collect ordnance two days before the Americans had been sighted. The Americans also demanded and received several thousand pounds in Army Bills, which had been in the keeping of Prideaux Selby, the Receiver General of Upper Canada, who was mortally ill. The American loss for the entire battle was officially reported as 52 killed and 254 wounded for the Army and 3 killed and 11 wounded for the Navy, for a total of 55 killed and 265 wounded. The British loss was officially reported by Sheaffe as 59 killed, 34 wounded, 43 wounded prisoners, 10 captured and 7 missing, for a total of 153 casualties. However, historian Robert Malcomson has found this return to be inaccurate: it did not include militia, sailors, dockyard workers or Native Americans and was incorrect even as to the casualties of the regulars. Malcomson demonstrates that the actual British loss was 82 killed, 43 wounded, 69 wounded prisoners, 274 captured and 7 missing, for a total of 475 casualties. The first building of the Legislative Assembly of Upper Canada, along with a number of other buildings was set ablaze in the days after the battle. Between April 28 and 30, American troops carried out many acts of plunder. Some of them set fire to the buildings of the Legislative Assembly, as well as Government House, home to the Lieutenant Governor of Upper Canada. It was alleged that the American troops had found a scalp there, though folklore had it that the "scalp" was actually the Speaker's wig. The Parliamentary mace of Upper Canada was taken back to Washington and was only returned in 1934 as a goodwill gesture by President Franklin Roosevelt. The Printing Office, used for publishing official documents as well as newspapers, was vandalized and the printing press was smashed. Other Americans looted empty houses on the pretext that their absent owners were militia who had not given their parole as required by the articles of capitulation. The homes of Canadians connected with the Natives, including that of James Givins, were also looted regardless of their owners' status. Dearborn emphatically denied giving orders for any buildings to be destroyed and deplored the worst of the atrocities in his letters, but he was nonetheless unable or unwilling to rein in his soldiers. During the looting, several officers under Chauncey's command took books from York's first subscription library. After finding out his officers were in possession of looted library books, Chauncey had the books packed in two crates, and returned to York. However, by the time the books arrived to York, the library had closed, and the books were auctioned off in 1822. Sheaffe was later to allege that local settlers had unlawfully come into possession of Government-owned farming tools or other stores looted and discarded by the Americans, and demanded that they be handed back. The Americans sent the captured military stores away on May 2 but were then penned in York harbour by a gale. They left York on May 8, in miserable weather, and required a period of rest at Fort Niagara on the Niagara peninsula before they could be ready for another action. As a result of the battle, Major General Roger Hale Sheaffe was relieved of his military command in Upper Canada. Sheaffe's troops endured an equally miserable fourteen-day retreat overland to Kingston. Many members of the Provincial Assembly and other prominent citizens severely criticized Sheaffe, both for his conduct generally and during the fighting at York. For example, Militia officers Chewitt and Allan, the Reverend Strachan and others wrote to Governor General Prevost on May 8, that Sheaffe "...kept too far from his troops after retreating from the woods, never cheered or animated them, nor showed by his personal conduct that he was hearty in the cause." Sheaffe lost his military and public offices in Upper Canada as the result of his defeat. However, the Americans had not inflicted crippling damage on the Provincial Marine on Lake Ontario, and they admitted that by preserving his small force of regulars rather than sacrificing them in a fight against heavy odds, Sheaffe had robbed them of decisive victory. Secretary of War Armstrong wrote, "...we cannot doubt but that in all cases in which a British commander is compelled to act defensively, his policy will be that adopted by Sheaffe – to prefer the preservation of his troops to that of his post, and thus carrying off the kernel leave us the shell." The most significant effects of the capture of York were probably felt on Lake Erie, since the capture of the ordnance and supplies destined for the British squadron there contributed eventually to their defeat in the Battle of Lake Erie. Five currently active regular battalions of the United States Army (2-1 ADA, 1-2 Inf, 2-2 Inf, 1-5 Inf and 2-5 Inf) perpetuate the lineages of several American units (Crane's Company, 3rd Regiment of Artillery, and the old 6th, 16th and 21st Infantry Regiments) that were engaged in the Battle of York. An archeological dig led by Ron Williamson to mark the 200th anniversary of the war shed new light on the battle. The dig unearthed evidence that the destruction of the magazine and its impact on US forces was bad luck. The Americans just happened to be at the exact distance of the shock wave and its debris field. The documentary film Explosion 1812 argues that the battle had a much greater impact than previously assumed. The mistreatment by US forces of the civilian Canadian population, dogged resistance by militia and the burning of British symbols and buildings after the battle led to a hardening of Canadian popular opinion. Chauncey and Dearborn subsequently won the Battle of Fort George on the Niagara peninsula, but they had left Sackett's Harbor defended only by a few troops, mainly militia. When reinforcements from the Royal Navy commanded by Commodore James Lucas Yeo arrived in Kingston, Yeo almost immediately embarked some troops commanded by Sir George Prevost and attacked Sackett's Harbor. Although the British were nevertheless repelled by the defenders at the Second Battle of Sacket's Harbor, Chauncey immediately withdrew into Sacket's Harbor until mid-July, when a new heavy sloop of war had been completed. The town of York was attacked again in July 1813, when a battalion of troops led by Colonel Winfield Scott raided the undefended town. The Americans burned a barracks and seized 11 batteaux, 5 cannons and some flour. Chauncey returned some private property, and books from the public library, which had been looted after the Battle of York. On the morning of July 31, 1813, a U.S. invasion fleet appeared off York (Toronto) after having withdrawn from a planned attack on British positions at Burlington Heights. That afternoon 300 American soldiers came ashore near here. Their landing was unopposed: there were no British regulars in town, and York's militia had withdrawn from further combat in return for its freedom during the American invasion three months earlier. The invaders seized food and military supplies, then re-embarked. The next day they returned to investigate collaborators' reports that valuable stores were concealed up the Don River. Unsuccessful in their search, the Americans contented themselves with burning military installations on nearby Gibraltar Point before they departed. ^ Peppiatt, Liam. "Chapter 31B: Fort York". Robertson's Landmarks of Toronto. ^ Colonel Ichabod Crane commanded Company B, 3rd U.S. Artillery. ^ Lossing, Benson (1868). The Pictorial Field-Book of the War of 1812. Harper & Brothers, Publishers. p. 590. ^ "The Mace - The Speaker". Speaker.ontla.on.ca. Retrieved May 27, 2018. ^ "War of 1812: The Battle of York". Toronto Public Library. 2019. Retrieved April 12, 2019. ^ "War of 1812 explodes on TV". News.nationalpost.com. June 16, 2012. Retrieved May 27, 2018. ^ Roosevelt, Theodore. The Naval War of 1812. New York: Modern Library. p. 131. ISBN 0-375-75419-9. ^ "DHH - Memorials Details Search Results". April 2, 2015. Archived from the original on April 2, 2015. Retrieved May 27, 2018. Wikimedia Commons has media related to Battle of York. Borneman, Walter R. (2004). 1812: The War That Forged a Nation. Harper Perennial, New York. Forester, C. S. The Age of Fighting Sail. New English Library. ISBN 0-939218-06-2. Hickey, Donal R. (1989). The War of 1812, A Forgotten Conflict. University of Illinois Press, Chicago and Urbana. ISBN 0-252-01613-0. Hitsman, J. Mackay (1995). The Incredible War of 1812. Toronto: Robin Brass Studio. ISBN 1-896941-13-3. Malcomson, Robert (2008). Capital in Flames: The American Attack on York, 1813. Toronto: Robin Brass Studio. ISBN 1-896941-53-2. Malcomson, Robert (1998). Lords of the Lake:The Naval War on Lake Ontario 1812–1814. Robin Brass Studio, Toronto. ISBN 1-896941-08-7. Paine, Ralph Delahaye (2010) . The fight for a free sea: a chronicle of the War of 1812. Yale University Press, New Haven, 1920. p. 235. ISBN 1-59114-362-4. Zaslow, Morris (1964). The Defended Border. Toronto: Macmillan of Canada. ISBN 0-7705-1242-9.